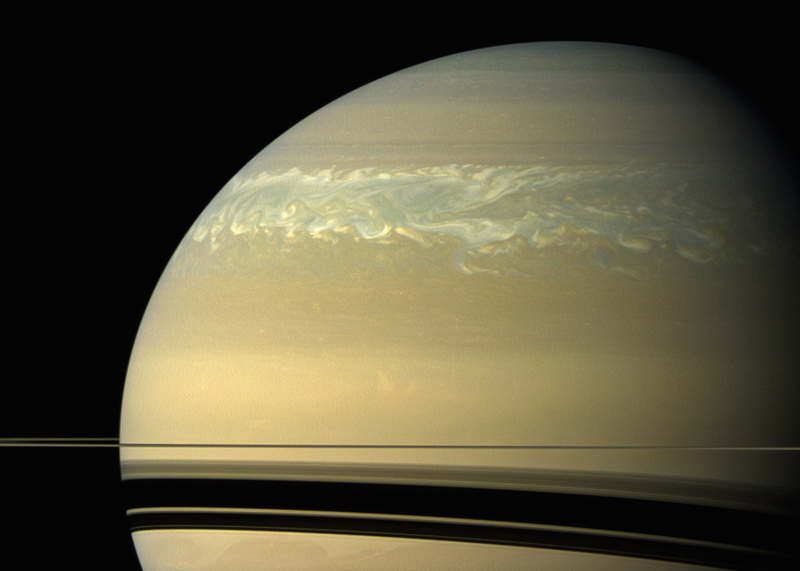 Saturn’s storms are also known as “great white spots,” an analogy to the Great Red Spot on Jupiter. 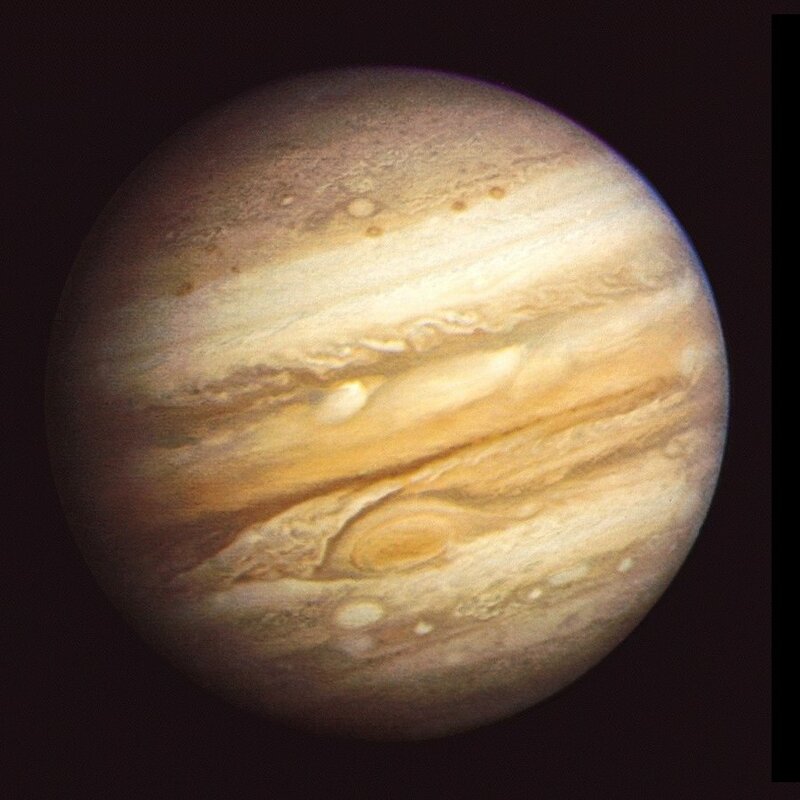 There are, however, other differences: Jupiter’s spot does not have any lightning and is calm at the centre, like a hurricane on Earth. But Saturn’s spots are much more active, brimming with lightning and forming long “tails” or “storm alleys” which can wrap around the whole planet. Winds blow at hundreds of miles per hour and the lightning can be 10,000 times stronger than any seen on Earth! During the past 140 years, astronomers have observed six such massive storms—the latest of which began in December 2010 and stretched around the planet within six months. The storms tend to alternate between the equator and mid-altitudes. So what causes these enormous alien storms? Astronomers had noted that they occur when Saturn’s northern hemisphere is tilted toward the Sun. That was a clue, but now they think they better understand the process of just how they form. The new study, called “Moist convection in hydrogen atmospheres and the frequency of Saturn’s giant storms,” was published April 13, 2015, in the advance online issue of the journal Nature Geoscience. It is supported by the National Science Foundation as well as NASA. This process leads to a cooling of the upper atmosphere over time. Eventually, however, that cooling overrides the suppressed convection, and warm, moist air rapidly rises, triggering a thunderstorm. “Previous studies using spectroscopy have shown that Saturn’s interior is enriched in methane and other volatiles, by two or three times, compared to Jupiter. From there, it’s a short leap to expect that Saturn is also rich in oxygen, which is also a volatile and a big part of every H2O molecule,” said Ingersoll. The Juno spacecraft, which is currently en route to Jupiter, will be able to measure the water vapor abundance in the gas giant planet’s atmosphere more accurately starting in November 2016, which can then be compared to the Cassini data from Saturn. Juno will be the first spacecraft since Galileo to visit the Jupiter system. “That should help us understand not only the meteorology but also the planet’s formation, since water is expected to be the third most abundant molecule after hydrogen and helium in a giant planet atmosphere,” Ingersoll said. 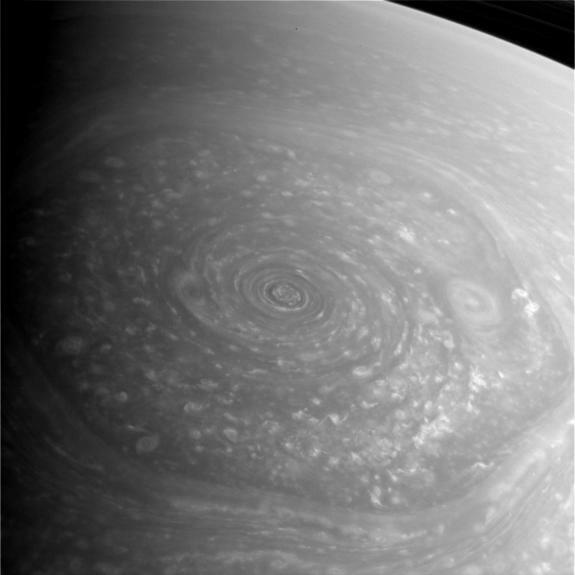 As well as the thunderstorms, there is also the bizarre and well-known hexagon-shaped weather system which rotates around Saturn’s north pole, one of the most visually stunning sights in the Solar System. At its centre is a circular hurricane-like wind system, similar to ones on Earth but larger. Meanwhile, the Cassini spacecraft continues to orbit Saturn, studying that planet’s atmosphere and moons. It recently took new close-up images of the moon Rhea, showing the heavily cratered surface in sharp relief. Although quiet now, Rhea clearly has had a violent geological history. With no atmosphere, there is no erosion to erase the many impact craters on its surface. Cassini also imaged long, tenuous icy tendrils originating from the geysers on the moon Enceladus. The tendrils extend tens of thousands of miles into Saturn’s E ring. Scientists have even been able to identify which geyser a particular filament comes from. The tendrils can also provide new clues about the water sea or ocean beneath the surface which feeds the geysers. Cassini is still in excellent health, orbiting Saturn every 28 days. By studying storm systems on other planets like Saturn and Jupiter, scientists can learn more about atmospheric processes on planets in general, even exoplanets. Evidence for strong wind systems has already been found for some exoplanets in far-off solar systems. It is also a reminder that while storms on Earth can be bad and extremely dangerous, they still pale in comparison to storms on some other worlds, which would seem to be a good thing.